John Caperon, Andrew Todd and James Walters, ed. A Christian Theology of Chaplaincy. Jessica Kingsley Publishers, 2017. 176pp. This book is a collection of essays originally presented at a symposium on chaplaincy at Westcott House, Cambridge in April 2015. The editors and most of the presenters in the volume are associated with the Church of England, though chaplaincy in other denominations and countries is explored as well. The goal of the meeting was to explore a common understanding of chaplaincy in its various forms. 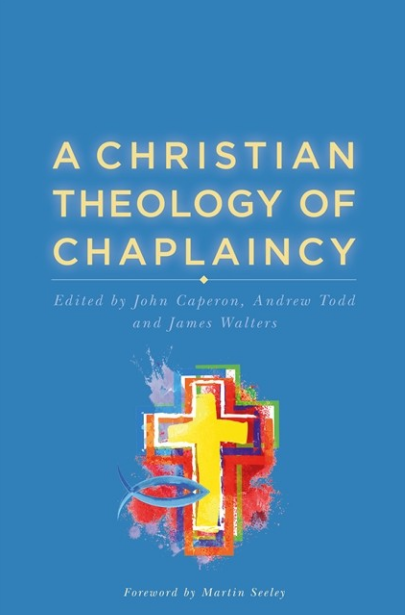 Though chaplaincy has grown rapidly in many contexts in the past several generations, the editors argue that there has been little theological discussion about it, including not having an agreed definition of the term chaplain. A critical discussion throughout the book is the relationship between chaplaincy and the church. Chaplains have found their roles outside of the structures of a particular church. There are common challenges when it comes to thinking about how to engage pastorally with non-Christians and how chaplaincy might be carried out in a multi-faith environment. In his essay John Caperon notes, “the fact remains that chaplaincy is still often regarded as something of a sideshow to the established Church’s central, traditional understanding of ministry as being rooted in parish and church, vicar and people.” (119) His argument is that local parishes need to expand their understanding beyond a limited geographical community, but also all the other groups with which they are associated in wider society. The book is helpful for a number of reasons. First, it can give those in chaplaincy ministry, including port chaplaincy, some language to help understand their own work. Though hospitals, prisons, or the military are significantly different from ports, it is still ministry in public spaces, so learning across these boundaries is useful. Second, listening to the various authors in the book, one gains a better appreciation for the personal characteristics and attitudes that are best suited for service as a chaplain. An especially useful discussion is that by researcher Ben Ryan on models of chaplaincy, where he adds to the discussion of Miranda Threlfall-Holmes in Being a Chaplain (2011). Theological models of chaplaincy include missionary, pastor, historical/parish model, agent of challenge, incarnational/sacramental, and cultist/exile. Secular models of chaplaincy include pastoral care, spiritual care, diversity model, tradition/heritage model, the specialist service provider, and a community mediator model. These models are not mutually exclusive; there is, no doubt, overlap between them. However, thinking in terms of models can also be useful for maritime ministries, both to better understand and explain their own work, but also to help reorient their work if they feel that they want to engage another model more fully.